Scotia Granite specialise in the supply and installation of granite worktops, quartz worktops and silestone worktops for residential and commercial clients throughout Glasgow, Edinburgh, Aberdeen, Dundee, Inverness and the rest of Scotland. With over 200 different styles of kitchen and bathroom worktops and countertops to choose from we have something to suit every conceivable taste and price range. 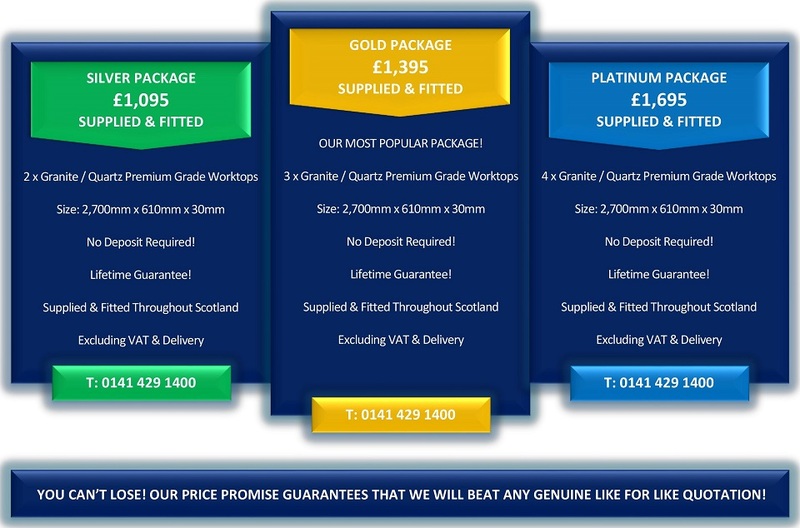 Our Price Promise guarantees that we will meet or beat any valid like for like quotation, making us the cheapest supplier and installer of quality granite worktops in Scotland. Additionally, we are so confident in the quality of our products and workmanship that all our worktops are guaranteed for life and the joint seals are guaranteed for 10 years. 0141 429 1400 - 8am - 10pm 7 Days a Week - or contact us today.